The Catholic Church in Iceland is part of the Catholic Church, under the spiritual leadership of the Pope. As of 2015[update], the Bishop of the Diocese of Reykjavík is Dávid Bartimej Tencer. The diocese is not part of any ecclesiastical province (there is no archbishop or responsible archdiocese), and the bishop reports directly to the Holy See in Rome. As of 2017[update], there are 12,901 Catholics in Iceland, with 6 diocesan priests, 9 religious order priests, and 38 sisters in religious orders. Catholics represent 3.81% of the Icelandic population. The Diocese of Reykjavík covers the whole of Iceland. 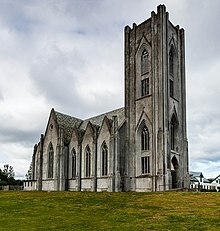 The diocese has a cathedral, Christ the King Cathedral (Dómkirkja Krists Konungs) in Reykjavík, and a number of smaller churches and chapels in the larger towns around the country. Before the Reformation, there were two dioceses in Iceland, the Diocese of Skálholt (first bishop, Ísleifur Gissurarson, 1056), and the Diocese of Hólar (first bishop, Bl. Jón Ögmundsson, 1106). During the Reformation, Iceland adopted Lutheranism in place of its earlier Catholicism. Two local men, Oddur Gottskálksson and Gissur Einarsson, became disciples of Martin Luther and soon secured followers, particularly after King Christian III of Denmark and Norway declared himself for Lutheranism and began to enforce the change in his kingdom. This led to resistance, which escalated nearly to the point of civil war. Jón Arason and Ögmundur Pálsson, the Catholic bishops of Skálholt and Hólar respectively, opposed the kings efforts at promoting the Reformation in Iceland. Pálsson was deported by Danish officials in 1541, but Arason decided to fight. Opposition to the Reformation effectively ended in 1550 when Arason was captured after being defeated in the Battle of Sauðafell by loyalist forces under Daði Guðmundsson. Arason and his two sons were subsequently beheaded in Skálholt on November 7, 1550. With Lutheranism firmly in place, Catholicism was outlawed, and Catholic church property was assumed by Iceland's rulers. Though Latin remained the official language of the Lutheran Church of Iceland until 1686, and a good part of the former Catholic terminology and other externals were retained, the Lutheran church differed considerably in doctrine. Those Catholics who refused to convert eventually fled, most making the unfortunate choice of Scotland as their destination. No Catholic priest was permitted in Iceland for more than three centuries. The Catholic Church established on 8 December 1855 a jurisdiction under the name Apostolic Prefecture of the North Pole (Praefectura Apostolica Poli Arctici) that included Iceland. Several years later, the two French priests Bernard Bernard (1821-1895) and Jean-Baptiste Baudoin (1831-1875) settled in Iceland in 1857 and 1858 respectively. They met with a difficult reception and in 1862, Bernard left the country, while Baudoin persevered until 1875. On 17 August 1869 Pope Pius IX set up an Apostolic Prefecture of Denmark, which now included Iceland. Freedom of worship was enacted in 1874. After an interval, Catholic missionary efforts were resumed, with by the turn of the century a church, a school and even a hospital run by nuns. The former jurisdiction became an Apostolic Vicariate of Denmark on March 15, 1892. Thereafter, the island territory became for the Catholic Church an independent unit, first as the Apostolic Prefecture of Iceland on June 23, 1923 and then, not many years later, on June 6, 1929, as the Apostolic Vicariate of Iceland. It was on October 18, 1968 that this entity matured into the Diocese of Reykjavik. 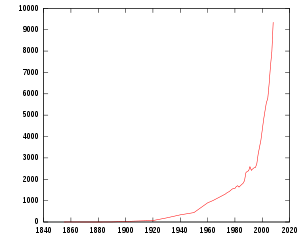 Even though the Catholic population remains small, both as a percentage of the overall population and in absolute numbers, it grew from about 450 in 1950 to 5,590 in 2004, during which time the total population grew from 140,000 to 290,000. In the twentieth century Iceland had some notable, if at times temporary, converts to the Catholic faith. For a time Halldór Laxness was a Catholic. Although this did not last, his Catholic period is of importance due to his position in modern Icelandic literature. A more consistently Catholic writer in Icelandic was Jón Sveinsson. He moved to France at the age of 13 and became a Jesuit. He remained in the Society of Jesus for the rest of his life. He was well liked as a children's book author (though he did not write in Icelandic) and he even appeared on an Icelandic postage stamp. In 1989 Pope John Paul II visited Iceland. Today, the number of Catholics in Iceland, a predominantly Protestant country, comprises just under 3.81% of the population, and form the third largest denomination in the country. The Diocese of Reykjavík covers the whole of Iceland. There is a Christ the King Cathedral (Dómkirkja Krists Konungs) in Reykjavík and a number of smaller churches and chapels in the larger towns. The Bishop of Reykjavík participates in the Scandinavian Bishops Conference. Many of the Catholics are Eastern European and Filipino immigrants; if they are excluded, Catholics are about 1% of the population, the figure before immigrants started coming in large numbers. On 17 June 2017 a new Catholic Church was consecrated in Reydarfjordur in a ceremony led by Bishop Tencer. The church building was a gift from the Slovak Catholic Church. The church was built from wood in Slovakia, disassembled and shipped to Reydarfjordur where it was re-assembled. Robert Fico, the Prime Minister of Slovakia, attended the consecration. ^ Cheney, David M. "Reykjavik (Diocese)". www.catholic-hierarchy.org. Retrieved 2017-08-22. ^ "Populations by religious and life stance organizations 1998-2017". Statistics Iceland. Retrieved 2017-08-22. ^ Jenny Jochens, 'Late and Peaceful: Iceland's Conversion Through Arbitration in 1000', Speculum, 74 (1999), 621-55. DOI: 10.2307/2886763, https://www.jstor.org/stable/2886763. ^ "This beautiful church was a gift from Slovakia to Icelandic Catholics". Catholic News Agency. Retrieved 2017-08-22. This page was last edited on 14 February 2019, at 17:17 (UTC).